There is a belief that only that will be preserved, which is valued. And inherent to creation of value- is awareness. We at TTF believes there is a way. 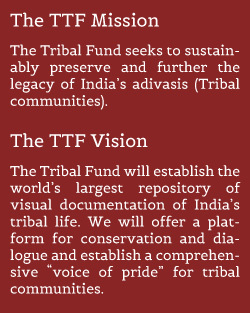 TTF has been established on the belief that if we can create awareness with mainstream society of the uniqueness of tribal traditions and cultures; society will learn to value them. Understanding and appreciation of the value will inherently lead to a need for preservation and conservation. When the tribal communities, which at present are at the crossroads of choice in retaining values versus amalgamating with the mainstream, realize that there does not need to be a choice; that preservation and amalgamation can go hand in hand, will make efforts to follow and preserve these traditional cultures. And we believe, regain their identity. India is home to 645 tribal communities. The legacy of these communities extends across all of geographical India and it is imperative that we document this heritage before it is lost. TTF is focused on creating opportunities for the acknowledgement of the tribal communities by the mainstream society and to realize the value of the tribal heritage in order to spur the process of conservation and preservation of tribal heritage.